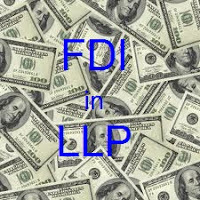 Foreign Direct Investment(FDI) in LLP (Limited Liability Partnership) got a nod from cabinet. The Government has decided to implement this in a calibrated manner. This shall now help LLPs to attract foreign investments and also structure themselves to become more competitive globally. It is a major boost to startups and SME segment who were forced to choose for a Pvt. Ltd. Co. if they were looking at foreign investments/ participation. Checkout our guide on How to choose my business to compare various business forms in India.